TORONTO - Katie Stelmanis and company’s debut is a proud example of a Canadian album that hasn’t had to rely on precarious (and tragically lackadaisical) bragging by pro-Canadian press. We see it far too often: Canucks raving about other Canucks, who are in truth, only mediocre, but given a plethora of extra gold stars for homeland status. The opening track, “Darken Her Horse”, begins with an abrupt vocal entry, an opportunity for lead vocalist Katie Stelmanis to establish her presence immediately. An isolated, reverberating chord is joined by other sparse, repetitive effects as the accompaniment layers into the chorus. Here the vocals become choral and warmer than before, comparatively speaking. 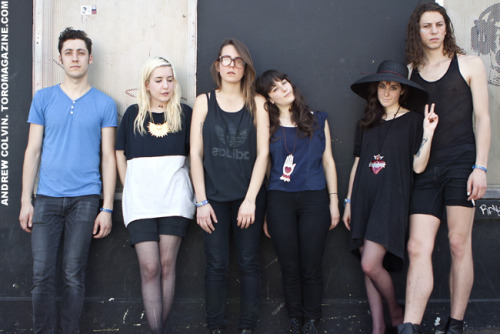 To call Austra a warm-sounding group is quite impossible. Equally inappropriate is to allot the bridge “soaring harmonies”, but despite their dark tone, such is achieved. For these reasons, the band can expect a decent level of respect from their fans and casual listeners alike. The second track- and second single- has a lighter, more-sparkly intro. (Mind you, we’re still talking on the more solemn side of the spectrum.) Minimalist lyrics are vague, wary of the departure of a significant other and perhaps the arrival of another… significant other? Five-finger scales commence on “The Future” to a subdued, determinate percussive beat and become the recurring theme on the 4-minute track, with a similar atmosphere to its predecessor. The end harmonies are slightly dissonant, producing an eerie finish and putting an end to the subtle optimism for the next track. “Beat and the Pulse”, the lead single, and its webbed/winged dancers, were a huge hit from their premiere, over three months ago. 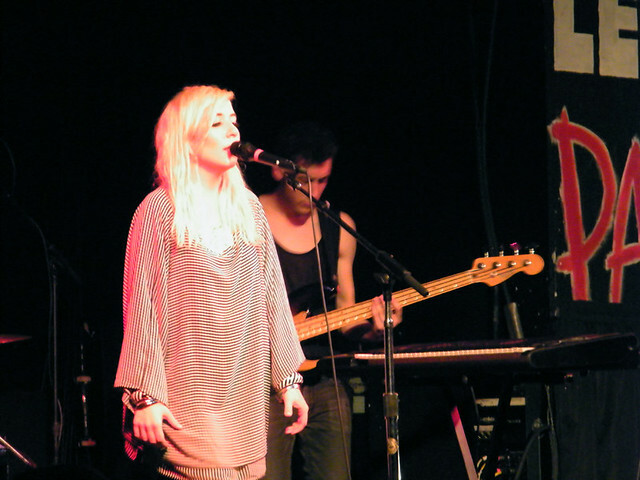 Still up to debate is the trio’s musical style, which has been labelled anything from goth pop to witch house. There is a definitive New Wave element to their atmospheric backdrops, while Stelmanis’s previous operatic vocal training is a key contributor to the sustained haunting effect present in her singing. As far as comparisons go, in my limited experience with this musical genre, I am tempted to say How to Destroy Angels on the industrial extreme and Zola Jesus, leaning towards the pop side. Austra is a wonderful gem for anyone who enjoys gothic, Dark Wave subgenres or has an affinity towards deeper, more soulful pop. Mid-album tracks, “Spellwork” and “The Villain” delve into stronger beats and a bit of jangle, reminiscent of Depeche Mode in the late ‘80s. Along with bubbly-accusatory “Hate Crime”, the former also sacrifices a little vocal sensitivity for raw feeling. Very post-grunge. In contrast, “The Choke” brings out insistent piano accompaniments, showcasing versatility and a softer, more emotional vocal line. Returning to “The Villain”, for I must praise it further, especially the bass line. Apart from sporadic hi-hat and ride cymbal, bassist Dorian Wolf provides the only driving rhythm until Maya Postepski’s entry with the rest of the kit. “Shoot The Water”’s moving accompaniment answers the call for much-needed variety at this point in the album. Stylistically, it is the outsider, with uptempo piano accompaniment, in the manner of soundtrack music to a locomotive scene in a silent movie. (Which, frankly, is too many words to describe a simple thematic idea, but it was too visually charming a description to avoid.) The track is this way until the end, unlike previous songs with segmented movements. Feel It Break is concluded with two tracks, one titled “The Noise”, the other “The Beast”. The former employs conversing vocals, at least in pitch and what seem to be electronically modified handclaps. The latter is piano-driven from the start, once again in that locomotive style. Stelmanis’s vocals in this finale are astonishing and stronger than ever; almost like a vocal bugle call of sorts (here I’m thinking “The Last Post” or “Taps”). Nice chordal end, but shortly after there is a wisp of piano. Maybe it’s a “to be continued” or a clumsy hand on the keyboard… eh, maybe it’s an inside joke. Nonetheless, it’s a heart-stopper, one of the standout tracks, which include “Beat and the Pulse”, “The Choke”, “The Villain”, and “Shoot The Water”- oh, I’m fully aware that accounts for half the album. Purchase this album digitally on iTunes or via Domino Records. Austra is: Katie Stelmanis (vocals, keys), Maya Postepski (percussion), and Dorian Wolf (bass); live: Ryan Wonsiak (keys), Romy and Sari Lightman (backing vocals). Official site.